There was a terrible accident involving a bookcase made out of reclaimed wood, with four shelves, three that were movable, and doors inset with seeded glass to give it an old look. A week or so ago, I cleared the spot where the delivery persons would carefully place this bookcase in the dining room. They arrived on time, came in to make sure their path was clear and then went back to the truck to get the bookcase. As I stood at the open door waiting for the delivery persons to gently lower the bookcase from the delivery truck and bring it into the house, I heard a crash followed by the tinkling of broken glass. "That cannot be good", I said to myself. I went out to the truck to find the two delivery persons standing next to the bookcase, the one made out of reclaimed wood, with four shelves, three that were movable, and doors inset with seeded glass to give it an old look. Only now it no long had glass in the door and three of the four legs looked as though a beaver had decided to snack on them. "Ma'am, you may not want to be around when I call my supervisor... blah blah blah. We'll get you another one." No, I explained, you probably won't be getting me another one as this was the last one, a closeout. They put it back on the truck, repeated their apologies and pulled away. Sure enough, the salesperson from the furniture store called a few days ago with the bad news. They cannot get another one, nor can she find a bookcase like it. And so my quest for a bookcase continues. At least for now I have all my old gardening books lined up and stacked up in one location, except for a dozen or so that are here and there around the house. I am going through several of them as I put the final touches on a presentation that I'm calling "Timeless Tips and Treasures for Today's Gardens". 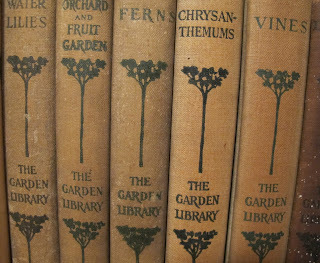 If I named the presentation the way they named old gardening books back in the day, I would actually call it "Timeless Tips and Treasures for Today's Gardens from the 19th and 20th Centuries Including Wisdom, Lore, and Ageless Advice for Every Gardener". Actually, I will probably call it that, anyway. I have an abundance of material to choose from and debated about how best to winnow it down to 45 minutes or so of useful information. For this go around, I think I'll stick with a half dozen writers - Lawrence, Bennett, Quackenbush, Bailey, Ellacombe, and Westcott. I have several books on just violets, violas, and pansies, some of my favorite flowers. But not everyone loves these flowers enough to listen to 45 minutes of material about them. Perhaps someday I can present on "All I learned from gardening I learned from violets". Or I could go back only fifty years or so to the 1960's. But I'm not particularly excited about calling a book "old" if it was published in my lifetime. I think I have this entire set, thanks to a reader who sent me the list of all the volumes included. Click, click, click, I bought all of them in December. Ida Dandridge Bennett wrote two of the volumes for this set, which is how I ended up finding out about it. 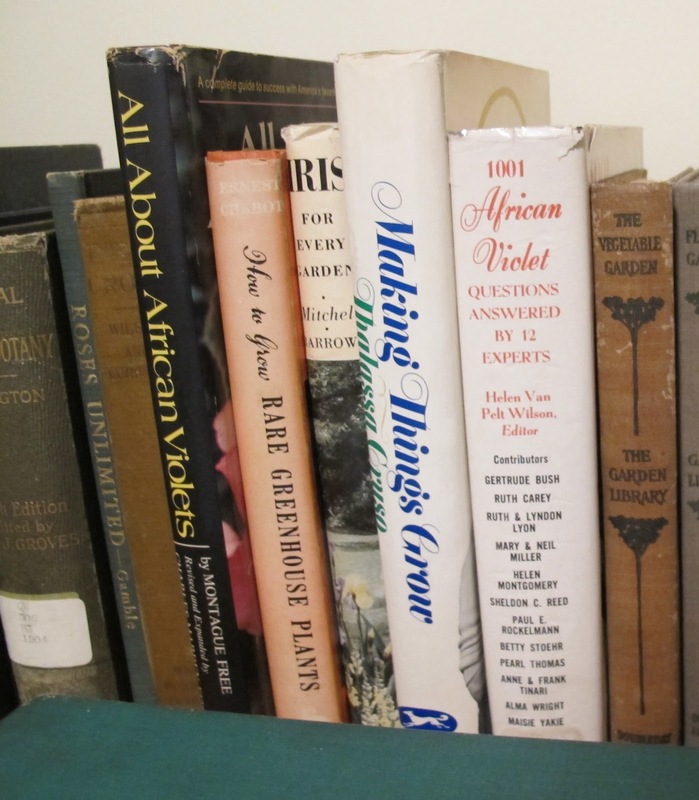 I'll be presenting this particular topic, "Timeless Tips and Treasures for Today's Gardens from the 19th and 20th Centuries Including Wisdom, Lore, and Ageless Advice for Every Gardener" three times in the next few months, and then adapting the material for another program in June. While I'm busy finalizing this presentation, looking for a bookcase, and ordering seeds, I may need a couple of garden fairies to post on my blog so it doesn't get stale. 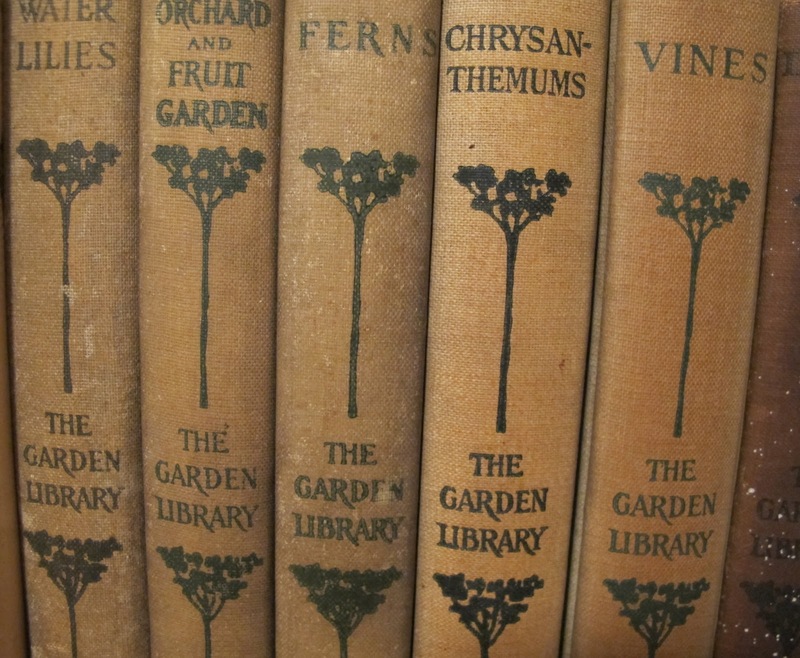 Fortunately, there is no shortage of garden fairies and book fairies here, especially when I open up all these old gardening books. 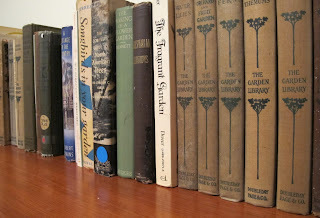 Love reading your blogs but this one was especially great as I love to collect vintage garden books too. They have the great old pics in them and nice covers. I will remember your garden fairy quote when I open one of my books! I am so very sorry about that bookcase being damaged. There must be an even better one out there waiting for you to find it. I am slowly building my own collection, my particular favourites revolve around violets and pansies too! I really love the Victorians obsessions with certain flowers and especially, their love of ferns. I also love Claire Leightons illustrations of rural life, and snap up her books whenever I find them! They are a real joy this time of year, we're snowed under in the UK right now so I have gardening withdrawal! I love your book collection too. I dream of having a 'library room' in my house one day - floor to ceiling bookshelves and ladders to climb! It's nice to spend time indoors as well as outdoors at this time of year! I bet those fairies will be throwing you a big ole birthday party soon. Bad news about the book case! Maybe the next one you will find, you will love even more! I hope so. I love old books but I now have my books on three different floors of the house as they keep growing in number - oh to have a library room! I am so sorry about what happened to your very unique bookcase. The rest of your post was delightful. Fascinated with the thought of a book all about Pansies, Violas and Violets. All favs of mine. Delightful post and I love your collection of books...it must be such fun going through them all. I will look forward to your next story! Sorry about your bookcase. Love your writing. I am sure another one will turn up. By the way, the title of your wil spark the interest of the audience. In Toastmasters we learn the importance of a catchy title. 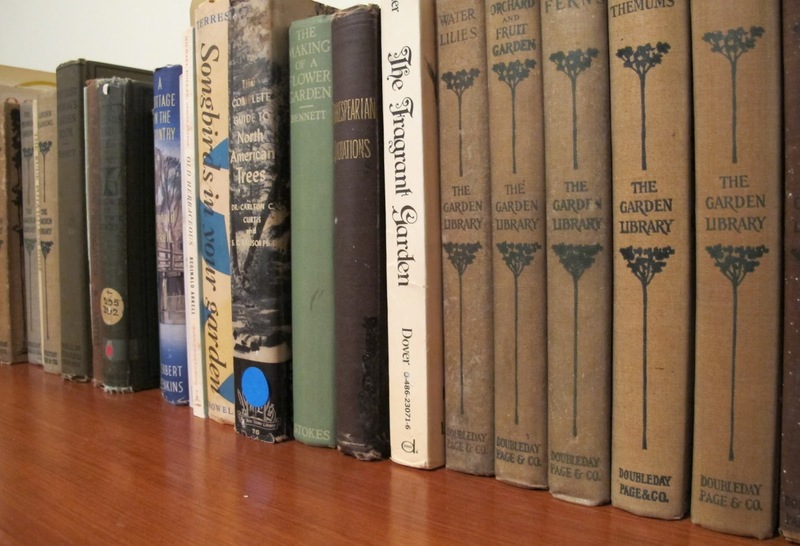 Ah, this post makes me nostalgic for my large collection of old garden books, which I sold when I retired. I bought many of them at a legendary used bookstore in Cleveland-so legendary, in fact, that I forget the name of the owner. Kay something. Also Publix books. Of course I never owned the wonderful, lovely flower books I could only visit in libraries like The Hunt Botanical Library at Carnegie Mellon in Pittsburgh. So pleased to hear that many of you younger gardeners (I'm 78) are interested in these.